I wrote this tutorial in 2009 - the methods are the same, but the tools have improved. Every mastering engineer has got his own style. My focus is to increase the intensity, especially when it comes to Drum & Bass. I want the music to sound loud and alive with special attention to the bass. That’s difficult to achieve and it took me about 10 years to figure out the best way to do it. My method works great for Vinyl and Digital file formats, since what’s good for Vinyl is good for the ear: No clipped square waves, stereo-phase problems, super-high frequencies and rumble below 20hz. Make sure the mixdown has enough headroom and isn't clipping, because what is lost, can't be restored. A good gain-structure for using a digital mixer is to start with all faders at -12db. When you're done mixing, the final master bus should peak around -6db , that way most digital mixers sound fine. Generally, a great master starts with a good mixdown. There is no mastering template. I listen to the tune and decide which of the above steps are necessary. 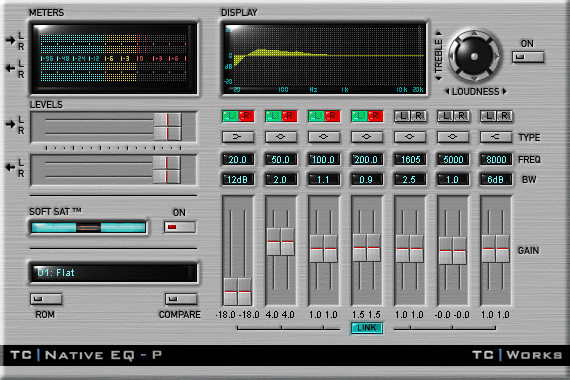 Since most dance music is produced in-the-box these days, I prefer to use digital mastering. Also, if a client wants corrections, the whole project is recalled with one click. I'm using Steinberg Cubase as mastering software. The audio plugins mentioned below are my favourites for each task, just translate the method to your own VST plugin choices. To demonstrate my method I chose a recent track of mine called "Supernatural II". On the left you can see the plugin chain used to master this tune. For demonstration purposes I made a loop from the track and switched on each plugin during every cycle. I like to cut all frequencies below 20hz, as there's usually Vinyl rumble (from sampling), DC offset problems (crazy vst plugins) and synthesizer wobble (LFO modulations for instance). I try cutting as much as I can without losing any important fundamentals of the sub-bass. For this track I highpassed at around 30hz. I use 3 equalizers in a row for tonal shaping. That might sound like a lot of equalizing - I just use the advantages and special touches each EQ has. Adding a little bass around the kickdrum, pushing the lower midrange at around 1.6k and using the high-end boost at 12khz. I often leave the cut-Filters engaged, as they add a tiny little phase-shift that makes the signal come alive. The high-end boost is also one of the best in the plugin world, as the whole EQ upsamples internally to achieve it's smooth response along with the gentle curves. I only use the mid-range EQ controls to bring out the signal broadly at 1khz to enhance the vocal. 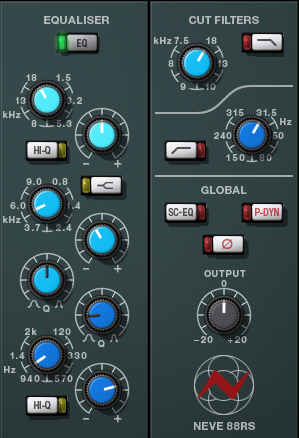 The UAD Neve 88RS is a "Formant Spectrum EQ" (UAD manual) that is just the right tool for midrange vocal adjustments. There also were some resonant peaks around 5khz that I've reduced because of harshness. This channel strip adds a phase shift in the lower frequencies, it "warms up" anything you pass it through. The file below is created with a normal and phase-inverted signal to highlight the 88RS processing - very low volume, as it's only the changed signal. As the last tonal-shaping step, I boost the super-low (20hz and above) and high frequencies (12khz) with a broad bandwith setting. Since this plugins also upsamples internally to 192khz, the high-end boost just sounds right. Switching in this plugin can be deceiving, since it boosts the volume +1.2db like the original hardware. For this tune I widened about 130% to bring out the vocal reverb and stereo room of the drums. I'm pretty careful with stereo plugins as they can cause phase-problems, but sometimes a broader image is enhancing the music. In-the-box mixes can sound sterile. This cute little Voxengo Warmifier plugin emulates several tubes and their characteristic behaviour. For mastering I use my favourite 12AX7A tube as it adds the right harmonics for bass and smoothes out hard attacks. Make sure the plugin is switched to "High-Quality" and Linear-phase mode, so the phase changes are minimal. Please note, this plugin is veeery subtle. The following is a Simon V special: To approach the final volume of the mastered track, I use a combination of bass equalizing and saturation. My method is octave-based and makes the low range solid and strong. I figure out the key of the tune and exactly locate the bass, kick and snare fundamental. In this instance I used a narrow boost at 50hz (Subbass), 100hz (Kick) and 200hz (Snare) alongside a steep highpass at 20hz. This all feeds into the soft saturation of the EQ and I'm adjusting each octave to taste. If you overdo it, the saturation becomes audible, but I'm usually very surprised how much level you can get away with. 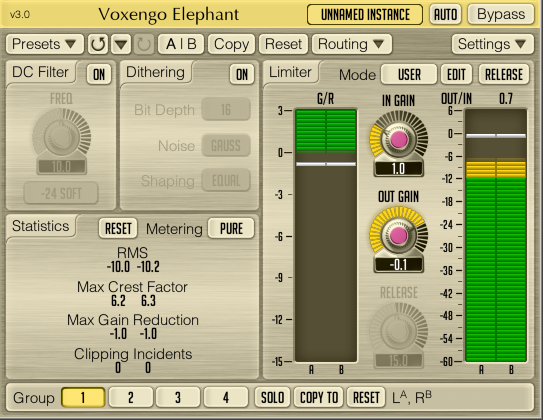 Voxengo Elephant is my favourite Limiter, it respects the transients, doesn't muddy up the bass and prevents square-waves as they're not cuttable on Vinyl. I use it here to prevent digital clipping and as final +1db volume boost. There's a freeware plugin called s(M)exoscope I can really recommend. I usually export the WAV and look at the audio in Soundforge, but with this little tool I can see what each plugin does to the signal live. It also helps to see if I've overdone the volume or how much headroom is left. Take the original mixdown and try matching the volume level of the final master. If the original mixdown sounds better at the same volume than the master, then it's time to take a break and start fresh. If the final master sounds better than the mixdown level-matched, I've done a great job and it's time to party! I also try to reserve an extra day for most mastering jobs, so I can listen with fresh ears the day after. Concerning the loudness war - As a mastering engineer I know how hard it is to stay out of the red-light district. Let's hope for the better and that in 25 years time the loudness wars will be forgotten and we'll have a common volume standard like in the movie industry. You can hire me for mastering your music. Before/After examples and details on my mastering page.